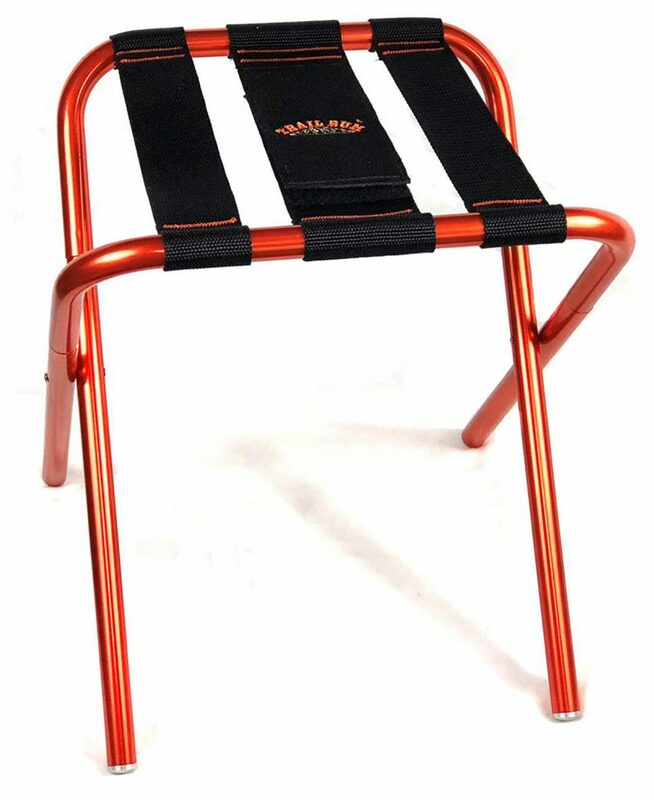 If you are in need of a multi-purpose camp stool check out the Trail-Bum by Trail Dogs. Those beautiful black straps with orange sewing came from our shop (the embroidery was done by a third party. According to my wife this must be comfortable. Years ago I had an orange T-shirt that I would not give up. I was informed that the “orange thing” must be comfortable otherwise I would have sent it to the dump years ago. Since then by definition everything orange must be comfortable. I am sure that these stools must follow my wife’s decree. I can attest that the straps are plenty strong. They are all heavyweight polypropylene. The two on the outside are 2″ width and the middle one is 3″. Sewing is all with Tex 90 polyester thread, in orange of course, which will provide great abrasion and UV resistance. We were asked to make a knife sheath and adjustable belt for workers in fish canneries. They needed to be rugged, inexpensive and easy to use. The sheath is made from our 2″ #673 webbing which is extremely stiff and in commonly used for scuba divers weight belts. A pair of rivets and a bit of sewing and you have a functional sheath. Every sheath needs a belt and this one needed to be adjustable and easily worn over cannery aprons or waterproof rain gear. Here we used heavyweight #560 polypropylene webbing in an 1½” width. There are a few inches of elastic webbing to keep it taught without being uncomfortable and a side release buckle to make it easy to put on and take off. Finally a slide keeps the tail end of the belt secure and makes sure it doesn’t decide to loosen on its own accord. Like the sheath there is minimal labor in producing the belt, helping keep the cost down. Is this something to wear around town? No, but it does fulfill the need if you are working in a cannery. Most of your orders for webbing and buckles have been shipped out using Priority Mail. This has proven to be an inexpensive and reliable way to get goods to our customers. At times we receive orders that are so small that the minimum charge for Priority Mail is larger than the cost of the goods. We have been shipping these orders using First Class Mail which generally saves you, the customer, a couple of dollars. We are working on providing that option for all orders that weigh less than 16 ounces. This requires that our shopping cart is able to calculate the weight of your order and then serving up the appropriate shipping options with their costs. Most of our components have been weighed and entered in to a database. Code is being written to do the calculations but it still needs to undergo testing. Our hope is to have this up and running by the end of March. In the interim, if you are ordering a couple of buckles and want them to ship First Class Mail, let us know in the comments section. We try to keep your shipping costs as low as possible anyway but there are times when you might want an order a day earlier (First Class Mail tends to take a day longer than Priority Mail) in which case tell us what your needs are. Looking for something a bit lighter than a strap, check out our Gear Wranglers. 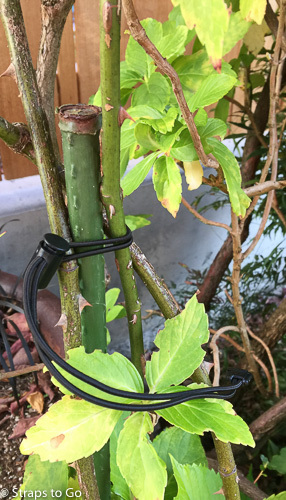 They are perfect for securing your light gear, attaching a plant to a stake or even keeping the bag of potato chips closed. Gear Wranglers are made using 1/8″ elastic cord and a cord lock to adjust their length. 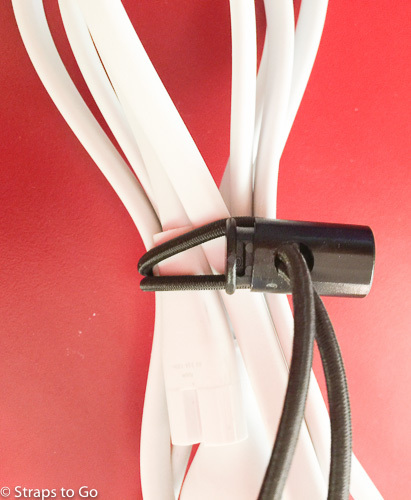 The come in 12″, 24″ and 36″ lengths and are packaged 6 to a bag. Like our Rod Wranglers the elastic cord ends are secured using a zipper pull. Order your Gear Wranglers now, if you order 3 packs (you choose the size) and put the code ROLLIE-PAYS in the comment section of our check out, Rollie will pay the shipping by US Mail. This offer ends November 30, 2016. Our shopping cart is not smart enough to pick up on this offer but be assured we will take care of it prior to your credit card being charged. 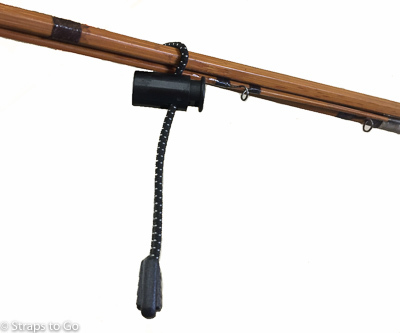 If you don’t need that many Gear Wranglers, but want a great way to keep your fishing rods corralled, check out our Rod Wranglers, you can even use them to make up the 3 packs for free shipping. 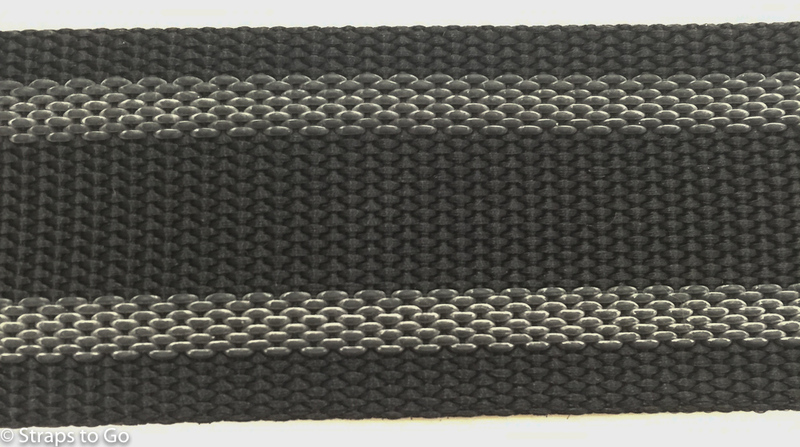 We now carry 1″ black polyester webbing with a 9/16″ reflective strip down the center. This material is thinner than the standard webbing we sell which makes it easy to sew on to bags, packs or even a coat. It is still sturdy enough to use for the adjustment straps on a backpack or with a buckle to fasten something to your bike rack. Polyester webbing is great for many uses since it has minimal stretch and doesn’t want to adsorb water. It is also quite abrasion resistant although the reflective strip will get worn off due to abrasion. We sell this material by the foot and you can order it online or come by our shop to check it out. The trend seems to be that all of our outerwear is getting darker and darker making it difficult for drivers to see us when we are walking or biking. Carrying a bag or pack with plenty of reflective surfaces will help you or your children stand out as our days become shorter and weather gets worse. This material is easy to sew so adding it to existing gear should not be a major issue for anyone with a sewing machine. 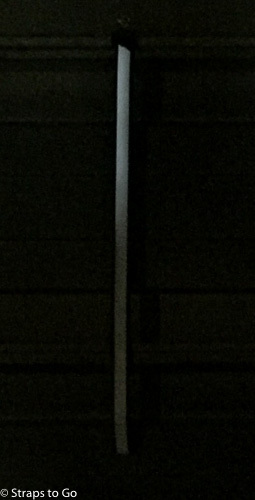 The webbing in these pictures was about 12″ long and the picture was taken using an iPhone from 15 feet away. It is pretty amazing stuff! We have made it through the dog days of summer, back to school gear is in the stores so hunting season must be fast approaching. We have 1″ buckles and nylon webbing in Coyote Tan. Polypropylene webbing in brown, taupe (light brown) and a bit left in forest green if you are looking for earth tones. 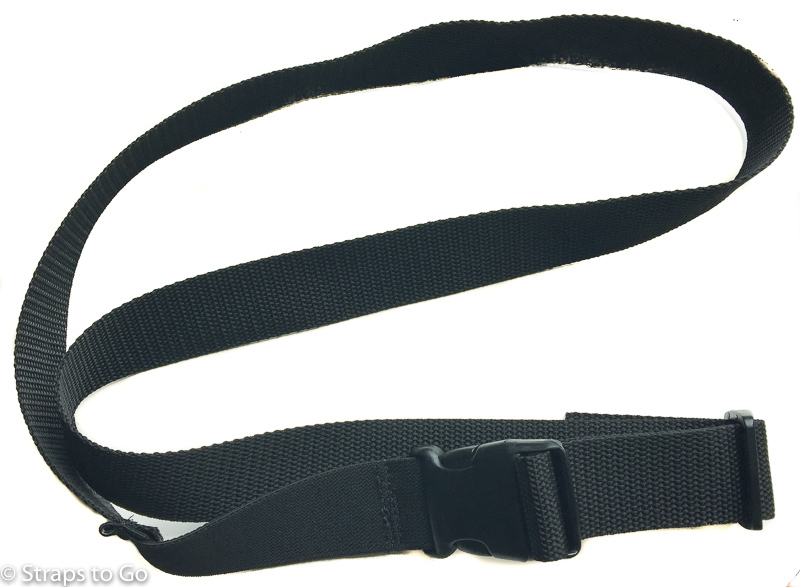 If you need to make a sling, this 2″ polypropylene webbing is perfect. 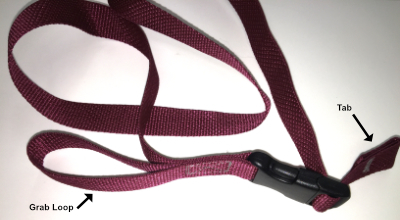 It has two rubber strips, the lighter color in the image, which help keep it planted on your shoulder. We sell components but will also sew whatever you can design. Our minimum order is 1 and if you are in the Tacoma area, stop in and we can discuss your project. Do the straps on your spa cover look like this? If so we have the solution. American Cord and Webbing’s SPA buckle is a great replacement for any old, broken spa cover buckles. 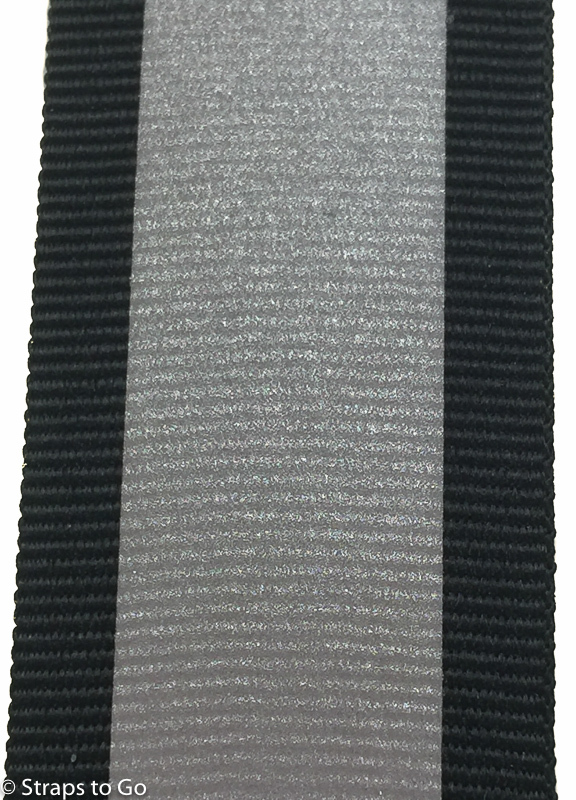 The SPA buckle is a locking, side release buckle designed for use with 1″ webbing (or other materials as shown). It is made from Acetal plastic to provide exceptional service life. The female portion of the buckle is attached to the covering sides of your hot tub (or the deck) using two screws. 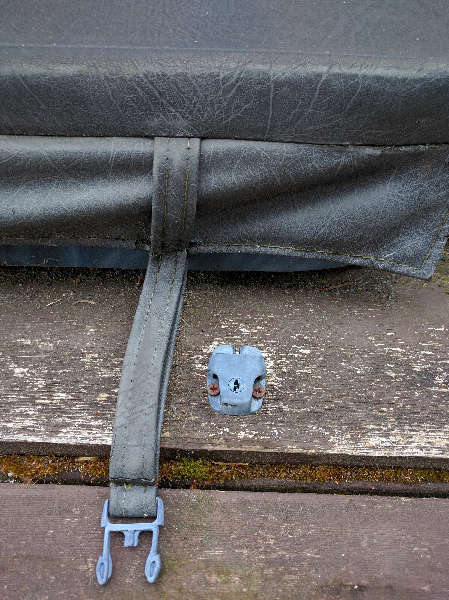 If your state or municipality requires spa covers that lock to protect youngsters, ACW’s SPA buckle is the answer. We will soon be producing quick release sail ties in a wide variety of colors. Unlike our other sail ties, these have a side release buckle, hence the “quick release”, grab loop and sewn tab so you can’t lose the male half of the buckle. They are made using polypropylene webbing which does not adsorb water or bleed pigment. All sewing is done using A&E’s SunStop polyester thread which has advanced UV protection which helps maintain the strength of the stitching over time. Just click the buckle closed, grab on to the loop and tab and it is easy to cinch up the sail tie. These should be available online in July, if you want some sooner give us a call at (253) 883-5800. 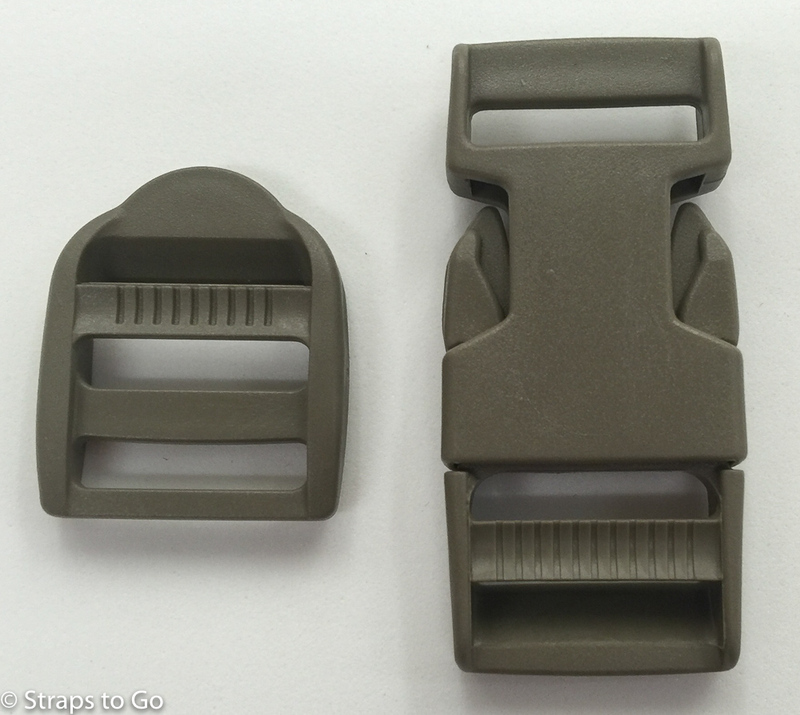 Plastic buckles- what are they made out of? Are all plastic buckles the same? No they are not. All have their strengths and weaknesses and many products are available in more than one plastic so you can choose what will work best in your application. Strength, resistance to heat or ultra-violet light and cost all factor in to what is best. So in alphabetical order lets dive in. Retains mechanical properties up to 250° F.
Putting the factors together Acetal provides the best performance of the three materials (other than for very specialized high temperature applications). So why do some vendors offer polypropylene buckles and hardware? Price. Polypropylene is around 15% less expensive and if price is the driving factor, it can’t be beat. You are trading off durability but in some applications that is not needed. When you browse our selection of buckles and hardware we tell you what each piece is made from. That applies not only to plastic but also to metal products. In the case of stainless steel, we try to identify the class of material the piece is made out of so you can tell if it is type 316 which will not even stain or type 304 where you will see some rust stains over time. If you have any questions give us a call, (253) 883-5800 and we will try to answer your questions. Posted on June 21, 2016 Categories ProductsTags buckles, plasticLeave a comment on Plastic buckles- what are they made out of? Tomorrow is the start of the 9 day Seattle Boat Show. We will be in booth number 2122 on the Concourse Level (upstairs). 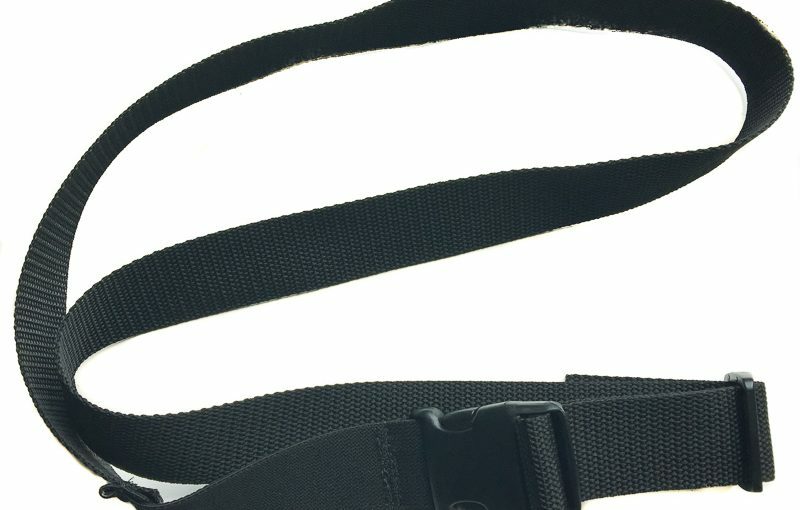 In our booth you will find a wide selection of side release buckle straps with polypropylene webbing, sail ties in both polypropylene and polyester webbing, jack lines, ratchet straps and belts. If you want to special order something, we can take care of that at the show. Don’t think we just make straps for boaters, if it is made with webbing (and is NOT designed for overhead lifting or life safety) chances are we can make it. There is no minimum order so even if you just need one of something, come by and chat. After the Seattle Boat Show, our next event is the Yakima Sportsmen’s Show in February. We will be in booth 419 from February 19th through the 21st.